I’m starting a new feature on my blog called ‘Live From UB’. I’m hoping to share a live performance (or at the very least rehearsal) by a local band once a week. I suppose Tuesday is as good a day as any to get going. 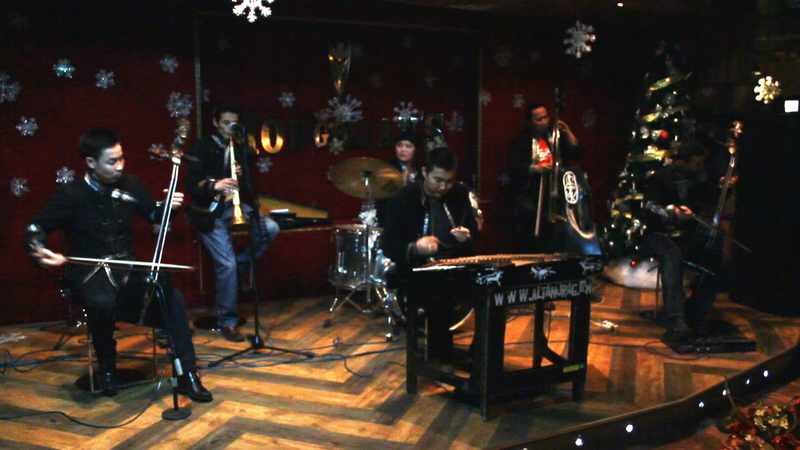 Here is Altan Urag, one of my favorite groups in Ulaanbaatar. They were all trained on traditional Mongolian instruments at the College of Music & Dance – Mongolia’s premier arts university. They’ve established a new genre here, called Mongolian folk rock, which combines traditional instruments and sounds with drums and modern beats. The best way to see Altan Urag perform is at one of the two big restaurants that host them several times a week: Ikh Mongol, and Mongolians. They are are two of the handful of establishments that feature regular live music. Although, bands tend to play 4-5 songs, and then pack up their instruments and call it a night. excellent musicians – and great to see they are keeping their cultural heritage alive. What does Jalam Khar translate to? btw, the drummer is very cute!